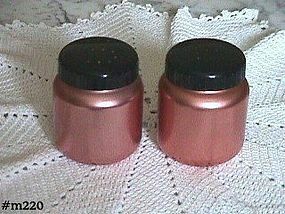 This listing has a set of aluminum salt and pepper shakers in pretty copper color with black plastic tops. Marked on bottom: Color Craft, Indp'l's, Ind. Shakers are in mint condition. Sorry, One has been Damaged. 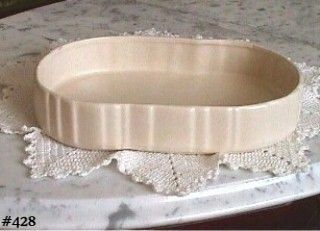 This listing has a set of 4 French style individual size casseroles from McCoy's brown drip dinnerware line of 1969! They are marked on bottom: 7054, McCoy, Lancaster Colony (mark), USA. All are in absolutely mint condition -- they look new! Marked NMCO (all letters are overlapping), this flower bowl is from the Lily Bud Line produced in the 1940s! It is a nice size bulb bowl, measures 6 1/2" x 9 1/2" and is a lovely matte white color. There is no evidence of "use", it does have a production flake-off on inside upper edge, this is production and is not detrimental. This is a beautiful older McCoy item in the very popular matte white color scheme. This listing has 2 McCoy Floraline pedestal planters in a beautiful avocado color with shiny over-glaze! The tallest one is 6 1/4" tall, 6" diameter, and is marked 477, Floraline, Lancaster Colony (mark), USA. The other one is 4 1/2" tall, 4 1/4" diameter, and is marked USA. Neither planter has any evidence of "use" -- they look new! 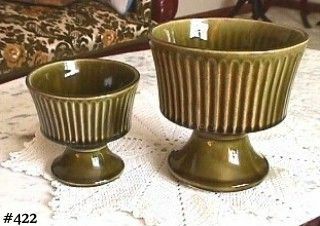 Mint condition McCoy small pitcher and bowl set in a beautiful avocado green color with shiny glaze. Pitcher has very decorative handle and rim, has in-mold leaves and grapes motif on side. Bowl has a scallop type edge and a pedestal type base, very decorative. Bowl measures 7 1/2" diameter and approx. 2 1/4" tall. Pitcher is not marked, bowl is marked on bottom: McCoy (in circle with lines), USA. 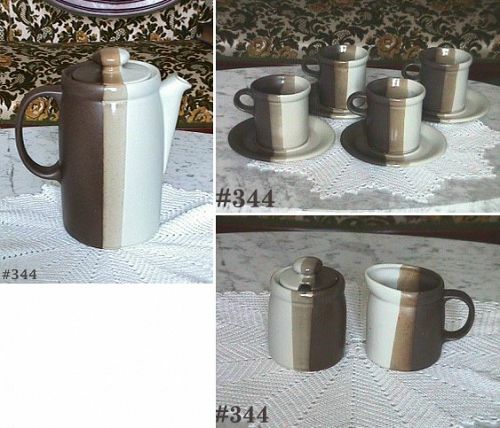 This listing has a McCoy salt and pepper shaker set in the almond color with brown stripes! Shakers measure 3 3/4" tall. They are in wonderful condition with some crazing (mostly the salt shaker base) -- that's it! This shaker set is equally at home used with McCoy's Pasta Line or Stonecraft dinnerware lines. 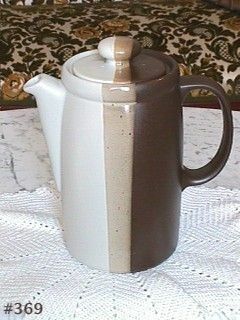 This listing has a coffee server from McCoy's pretty Sandstone dinnerware line of 1978! Sandstone items have three colors: white, dark brown, and tan. The colors on this piece are outstanding. It is in wonderful condition with the only "use" evidence being a couple small dings on pot bottom edge. Pot measures 8" to rim and bottom is marked: 1419, McCoy, Lancaster Colony (mark), USA. This listing has McCoy's turkey platter that was made in 1973! 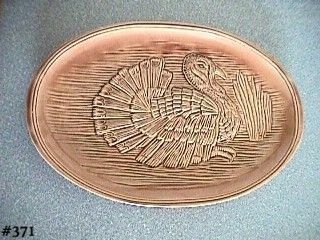 Platter is a pretty light tan color with an in-mold turkey. 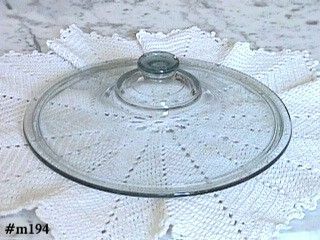 It's a nice size for your holiday serving needs -- it measures 16" x 11". Platter is marked McCoy and it's in excellent condition -- has a very small imperfection on edge that is so small that I am unsure if it is a tiny ding or a production glaze skip. Whichever it is, it does not detract in any way from this lovely item! 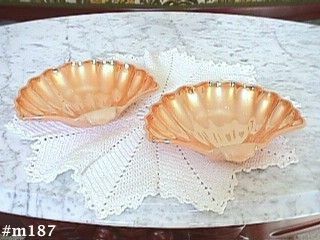 This pitcher and bowl set is the smaller size of McCoy's Strawberry Country sets! 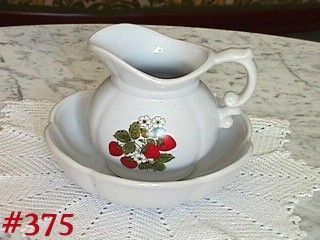 Pitcher measures approximately 5 1/4" tall, bowl measures 2 1/2" tall, and 8" diameter. Both pitcher and bowl are marked on bottom: 7528, McCoy, Lancaster Colony (mark), USA. Set is in mint condition with no evidence of use! The bottom of bowl (underneath) has a production non-glaze -- a typical McFlaw -- not detrimental in any! 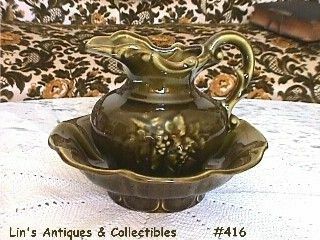 This listing has a very pretty McCoy planter from the Antique Curio Line! 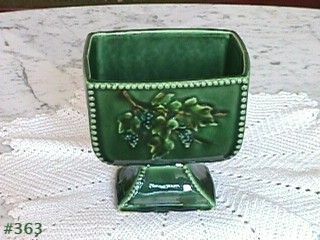 This is the pedestal type planter, measures 5" X 4" and is in the rather difficult to find green color. Marked on bottom: McCoy, USA. Planter is in excellent condition -- no chips, no cracks, only very light crazing! Please note: this planter has a very shiny clear over-glaze. Any places that appear to be damage/white color are from our camera flash or light reflection -- absolutely not damage! 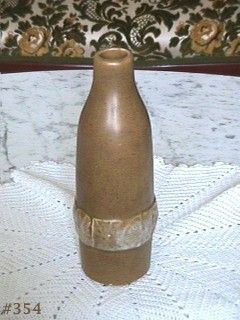 This listing has an unmarked McCoy bottle vase designed by Billie McCoy in 1954! Vase is 8" tall and is marked on bottom: USA. It is in wonderful condition -- bottom edge has a super teeny ding that in way detracts from this vase and really is not worthy of mention. McCoy's Amber-Ware dinnerware line was produced in 1962 and was their first attempt at making dinnerware! This listing has a mixing bowl measuring 7 3/4" diameter. 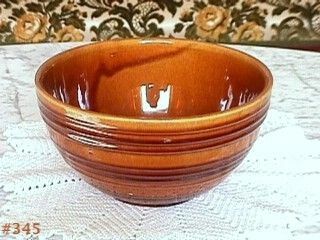 It is a beautiful warm amber tone color with a shiny glaze and is marked on bottom: McCoy, USA, Ovenproof. This listing has a beautiful McCoy coffee service from the Sandstone dinnerware line of 1978! 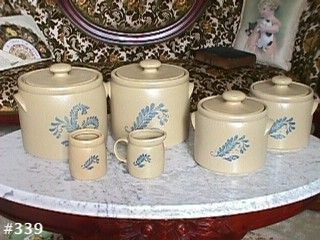 The set consists of the following: coffee server (marked 1419, Lancaster Colony mark, USA),creamer (marked 1414,USA), sugar with lid (marked 1414, McCoy, USA),4 cups (marked 1412, McCoy), and 4 saucers (marked USA). 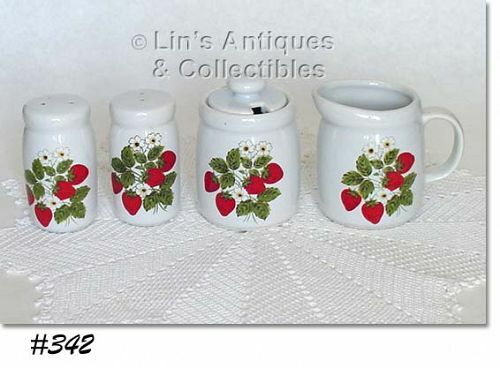 This listing has a salt and pepper shaker set and matching creamer and sugar with lid -- all from McCoy's pretty Strawberry Country dinnerware line! Salt and pepper measure 3 1/2" tall. Shakers are in wonderful condition; the pepper has a 1/8" glaze ding on top edge. Both have lost their stoppers (I have some new food grade stoppers and will replace with a set of those prior to shipping). 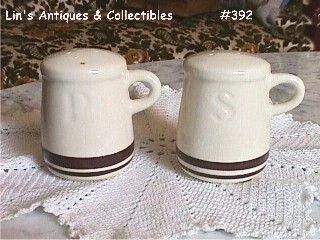 Creamer and sugar measure 3 1/2" tall and both are marked 1414, USA. What a great find -- a 4 piece canister set from McCoy's Bluefield Dinnerware line! Bluefield is an oatmeal color with a blue frond/leaf design. It was introduced by McCoy in 1977 and was produced to compete with a similar line that was produced by Pfaltzgraff. Canisters measure as follows: 2 are 6 1/4" tall, 7" diameter and the other 2 are 5 1/4" tall, 5 3/4" diameter. 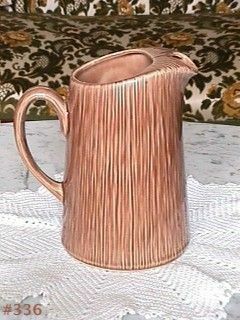 Very pretty McCoy pitcher that has a wood grain design and color (tan). Marked on bottom with Mt. Clemens, USA. Pitcher measures 7 1/2" tall and is in wonderful condition -- has no chips, no cracks. It has 1 tiny (about 1/4") production stress on bottom rim that does not go through -- it is production and is of no consequence. Very nice item and a difficult find!